Fuseworks search now includes ‘sort by’ options, so you can find the most recent search results as well as the most relevant. ‘Sort by’ works on a sliding scale, which lets you dynamically re-order search results. If you want to see more relevant search results, slide the button towards ‘Relevancy’; and if you want to give preference to more recent articles, slide the button towards ‘Date’. You’ll see the results change according to where you stop on the scale. Seeing all the matching results for a search query is now just a matter of scrolling down the page. We’ve implemented ‘infinite scroll’ on Fuseworks search, which means that whenever you approach the end of a search results page, more matching results will automatically be loaded for you. Just click on the ‘Search’ tab within the Fuseworks application to try out the new options. Clicking the new ‘cog’ symbol at the top left of headline lists lets you filter what’s displayed by type. That means for any classification (e.g. rugby), source (e.g. 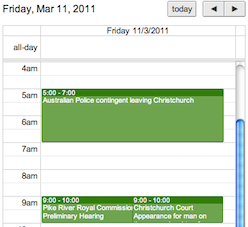 NZRU) or subscription you create, you can now see a view of related upcoming events. We’ve added a calendar to the Fuseworks Dashboard (the first page you see when you open the application). This gives you an at-a-glace view of what’s happening today. You can also click through to see other days in the calendar. Clicking on an event takes you through to its details. Fuseworks content administrators currently add a selection of events to the diary of national interest. You will soon be able to add and manage your own events as well. Over the next few months you’ll see Fuseworks roll out tools to enhance your ability to collaborate on the creation of news. The first step we’ve implemented is to enable you to add your own content, which is automatically related to other material within the platform. Content you add is private to you (indicated by the padlock symbol in the image above). In a future release, you’ll have the option to nomiate other users to see it too (i.e within your organisation). To add content, just email it to the folder in which you want it to appear @media.fuseworks.co.nz, from the email address connected to your account. For example, to email a document to your inbox, send it to inbox@fuseworks.co.nz. To send to a folder such as ‘Climate Change’ you add a underscore (‘_’) between the words – ie: climate_change@fuseworks.co.nz. Anything you email will also appear in your ‘All News’ folder and can be found via search. If you send Fuseworks a Word Document or non-image PDF, the text will be automatically extracted and formatted within the system as plain text. Over the last few weeks we’ve rolled out a number of behind-the-scenes changes to Fuseworks to improve the speed of the platform. You should notice that article pages and lists now open a lot faster and it’s snappier to move between tabs.